San Benito and Harlingen competitors of a 7-on-7 football tournament held at Bobby Morrow Stadium Monday, June 30, are pictured. 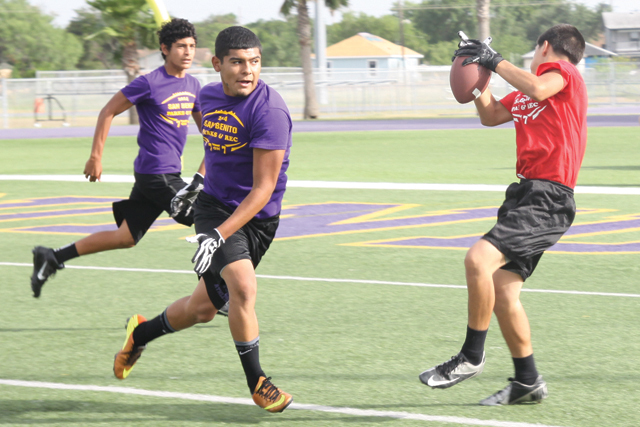 It was a successful debut for the City of San Benito San Benito Parks & Recreation middle school 7-on-7 football league, which closed out its season on Monday night at Bobby Morrow Stadium. The league, aimed to provide middle school athletes an opportunity to stay sharp and in football mode, featured five teams hailing from San Benito (from Berta Cabaza, Miller Jordan and Riverside middle schools), Harlingen and Rio Hondo and was deemed a success. Want the whole story? Pick up a copy of the July 6 edition of the San Benito News, or subscribe to our E-Edition by clicking here.